Apple plans to seed iOS 8.4 GM (Gold Master) to the developers and the iOS 8.4 GM will succeed iOS 8.4 beta 4 and will most likely be the final pre-release version before the software update is publicly released. After iOS 8.4 publicly release, many problems about data loss may happen just as previous iOS version release. 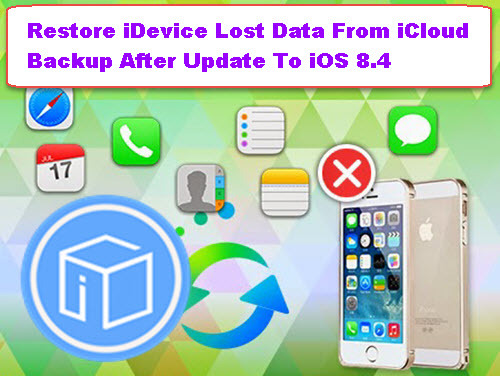 Today, another method is introduced to restore your iDevice lost data from iCloud backup once update to iOS 8.4. Last time, I wrote an article to show you how to restore lost data from iTunes backup when update to iOS 8.4. This time, I want to show you steps to restore lost data from iCloud backup after update to iOS 8.4. But, you have to make sure that you have a full-scale backup with iCloud before update to iOS 8.4 just in case of data loss. In other word, with an iCloud backup, you still have the chance to restore lost data with iFonebox. So what is iFonebox? iFonebox is a professional iOS data recovery software which is supportive to extract and restore lost data like contacts, messages, photos and videos from your iTunes or iCloud backup. Also, iFonebox better supported to recover deleted data like notes and calendars from your iDevice directly. It is known that iFonebox has three working modes: recover from iOS device, recover from iTunes backup and recover from iCloud backup. 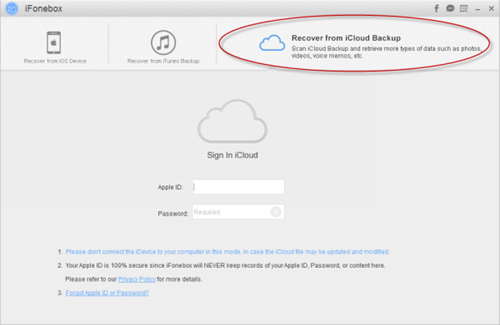 Here, I want to show you how to restore lost data from iCloud backup once update to iOS 8.4. Firstly, you can download Free Trial Version of iFonebox to have an experience. 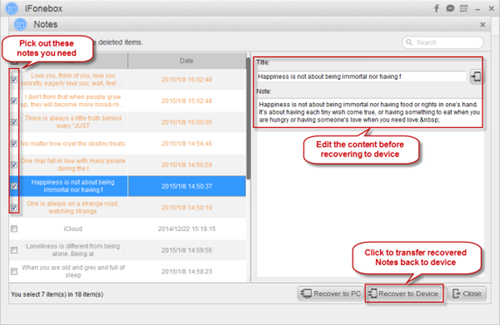 iFonebox lets users preview and recover all data from iCloud backup. Therefore, do not back up your iDevice with iCloud immediately when you find your data gets lost, because you will need to extract the latest backup from there. Step 1. Sign in to your iCloud. 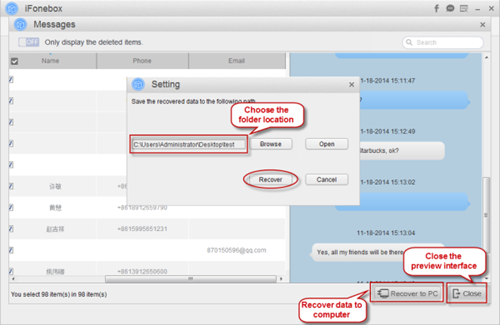 Run iFonebox and choose Recover from iCloud Backup mode. Then, sign in with your Apple ID and password. You should remember that you must have activated the iCloud feature before you sign in. Step 2. 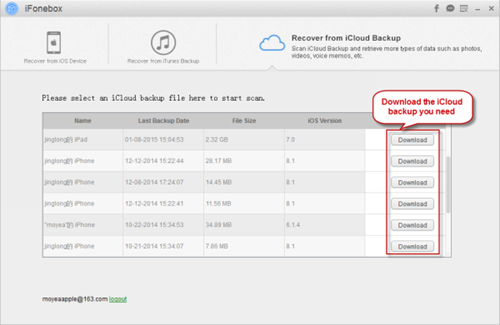 Download and scan data from iCloud backup. When you are logged in, all iCloud backup files are listed in your account. Choose one contain your lost data to download. Then you can scan data from the downloaded backup file. It may take a couple minutes, but it worth the wait. Step 3. Preview and select lost data to restore. After scanning, you are able to pick up those lost data to recover by clicking Recover to PC and all data you need will be recovered to your computer in a folder. Tips: Now, iFonebox can only supports to transfer recovered notes and contacts back to your iDevice directly. After scanning the two items, just choose the contacts or notes you need and click Recover to Device, then those data will be in your iDevice. You can also edit notes and contacts with iFonebox. This is the whole process to restore iDevice lost data from iCloud backup after update to iOS 8.4. It is quite convenient and powerful to use iFonebox to restore lost data once update to iOS 8.4. This entry was posted in iOS 8, iOS 8.4, iOS Device and tagged ios 8.4 update data loss fix, ios 8.4 update data loss problem, restore lost data from icloud backup when update to ios 8.4 by IosdroneD. Bookmark the permalink.